Four years ago today, Sari & I held our commitment ceremony. We were celebrating the ten years we had already been together and formally cementing our relationship. And all because Sari had the good sense to propose to me! I had long had an aversion to the idea of marriage, partly because my parents were so bad at it, and partly because I was offended at the idea that a religious or state institution was empowered to marry us — while at the same time preventing others (e.g., gay couples) from enjoying the same priviliges. So together Sari and I crafted a ceremony without any official endorsements, outside in a meadow (in upstate New York) with just our friends and family as officiants. And at the end we “married” ourselves. We cobbled the ceremony together from a friend’s wedding, which was based on a secular humanist text, some other sources, and our own inventions, edits, and additions. And we were blessed by the participation of not only the 50 or so witnesses, but an amazing group of friends and family who together performed the service. We’ve since had the pleasure of attending a number of weddings which used our text as the basis for their ceremony. It would be nice to think that this type of event is taking on a life of its own. The day of the ceremony was one of those perfect days — much like today — with temperatures in the 80s and no humidity. The sky was blue, with just a few clouds, and I’ll always remember it as one of the last truly happy days before the horrors to come. Only 16 days later, on another pefect late summer day, two planes flew into the World Trade Center. In celebration of our fourth anniversary, I’m attaching the text of the ceremony below. p.s. Special prize to anyone who can identify the source of our actual vows. They’re from two divergent places. Being the third and final installment of my history of stoop/yard/garage/street/sidewalk sales, with photos, illustrations, near-disasters, psycho killers, and more. Brooklyn — Not even officially resettled in New York, I’m nonetheless ready to sell my junk! Fortunately, wjcohen (also relocated to Brooklyn) has just as much Jewish merchant blood as me and he’s more than willing to host the sale, which becomes our first official annual stoop sale (seeing as he’s got a stoop!). With significant others Sari and Alison (and 9-month-old baby Lila) joining the cause, we pull off a good one. I’m what you’d call a dedicated stoop-seller. For the last five years I’ve had an annual sale here in Brooklyn (at my friend’s place in Cobble Hill to be exact), and I’ve had sales at many other places over the years. In fact, I may hold some kind of stoop/garage/yard/sidewalk/street sale-location record, with (in reverse order) San Francisco, Chicago, Manhattan, and San Diego also on my list. It must be in my blood: my great-grandparents included a Turkish rug merchant and the proprietor of a Lower East Side corner store. In addition, my mother, who’s an artist, has integrated a huge traveling garage sale into her installations for more than thirty years. 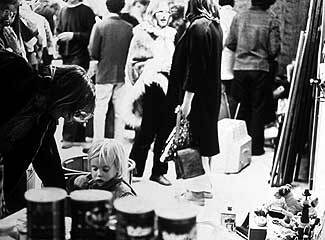 But whereas my mom uses the form of the garage sale to comment on the nature of art and commodification, I just love sellin’ stuff. Believe it or not, though, it’s not the profit motive that compels me. What really jazzes me about a sale is the idea that somebody wants something — a shirt, a picture frame, an old magazine — that I no longer need. And when their eye lights on that thing and we exchange some token amount of money, we both walk away from the transaction feeling like winners. I guess this confirms something about the world, about perception and point-of-view. Eye of the beholder and all that. And I gotta admit, it doesn’t hurt to get rid of a lot of junk and have some extra change jangling around in my pocket! But stoop sales are what I really look forward to, the opportunity to meet your customer and make that exchange face-to-face. Being a self-employed stay-at-home type, the stoop sale is my once-a-year chance to rub shoulders with — and sell stuff to — New York’s melting pot. Even in the white yuppie stronghold of Cobble Hill, our patrons include veiled Muslim women, Latino immigrants, Caribbean truck drivers, Chinese vagrants, European tourists, and the usual allotment of grungy hipsters. An added bonus of a good sale is the chance it offers to spend time with your friends. Recently, we’ve been doing group sales, with five, six, or more buddies, and what other opportunities are there nowadays to hang with folks for six hours? The social sphere of a sale is filled with chances to chat one-on-one, join together in a good pitch, swap clothes & junk, and dandle each other’s pets and babies. And when the day is done, the stoop is clear again, and the leftover stuff has been sent to Goodwill, there’s noting better than spending your earnings on good food and drink with the sales gang. Being a merchant at heart, I’m not much of a stoop sale customer. Unlike Sari, who will cross the street to check out a sale, I pass ‘em by without a second look — unless a vintage comic or cheap DVD catches my eye. Otherwise, I’m strictly a seller. Which is not to say that I haven’t “stooped” to accumulating inventory purely for the purpose of re-selling it. Being an artist, I’m not averse to “finding” stuff on the street (or in a garbage can or dumpster), not to mention the odd incredible deal at a thrift or antique store. But I know this is an unhealthy practice, and I try not to let it control me. Mostly my inventory is actual my stuff that for one reason or another has become obsolete or unnecessary. And of course all those useless holiday gifts that are un-returnable or not even worth re-gifting! Just to fill in the gaps a bit, here are some shots of a recent visit to my friends at Park Slope Physical Therapy. “Uh, ‘physical therapy’?” I quavered. And boy is she right. 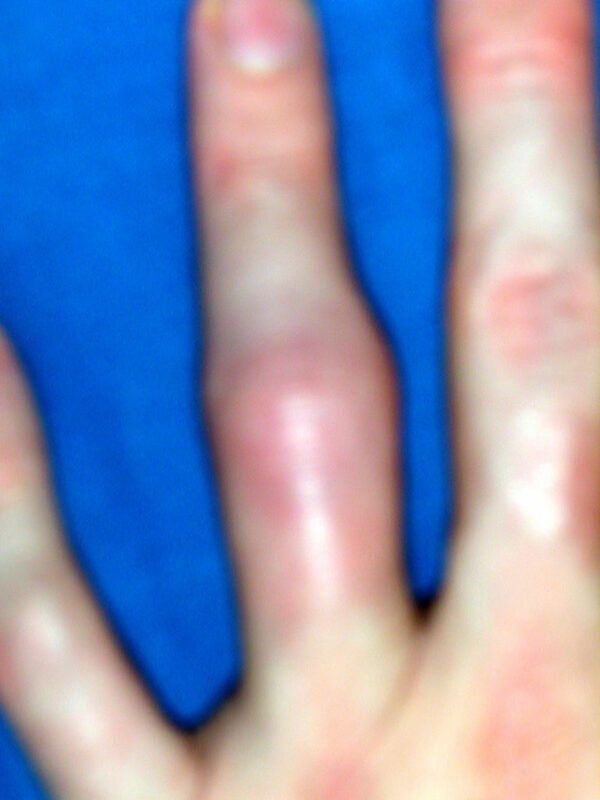 I thought I knew what pain meant after the ER doc re-broke my finger to get the bones back in the right place. But what I’ve been enduring — three times a week for the last three weeks — is worse, because it just goes on and on and on. “We need to re-set your finger,” the doctor said. 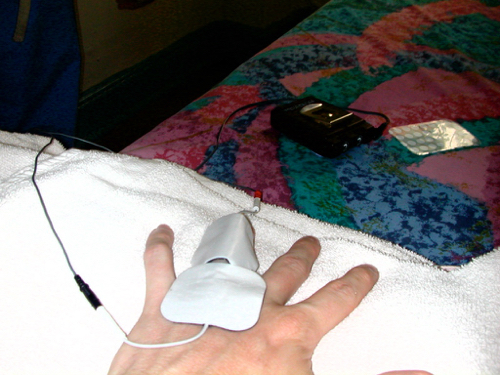 “Now, I can either do it real fast, or we can give you a couple of injections to numb it up and we can do it that way.” I contemplated my puffy, black-and-blue left ring finger, with the tip turning slightly inward. The doctor and I looked at each other. 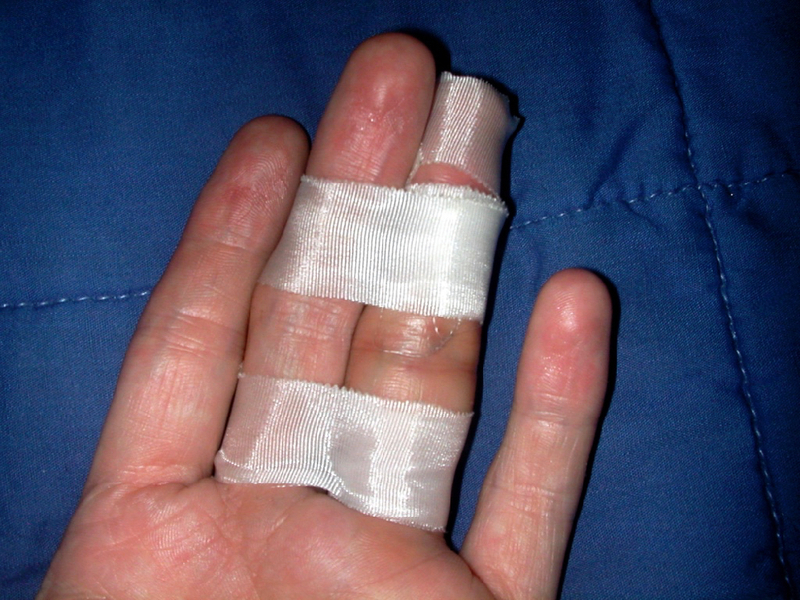 I was scared of having the broken finger popped back into place, but I was sicker of being in the ER. It was last night, going on our fifth hour there, and it was now almost six in the morning. “Whatever you wanna do,” I sighed. As the doctor pulled the curtain around my chair (to shield me from inquisitive eyes or to spare the onlookers from the gruesome sight?) I gave Sari a despairing glance. She widened her eyes in fear and sympathy. Then the doc and I were alone in our little space. Giving me another glance, he grabbed my finger and without any ceremony, yanked and twisted the last two joints. The pain was so intense that I almost didn’t feel it — it was like a burst of white light directly into my brain. My feet flew up into the air, and I could hear Sari let out a freaked-out giggle. For a second I imagined her view of the scene, with just my feet showing, and then flying up like that. It was horrible and comic all at once. Then it was back to the p-a-i-n. For some reason, this time the doctor not only yanked but felt compelled to grind and twist the digit as well. I confess to yelling a bit this time. But after some more attempts at fist-making and more comparisons with the other hand, he seemed satisfied. All I needed now were some follow-up X-rays and a splint, and we’d finally be released from ER purgatory. And all just nine hours or so after the whole stupid story began.